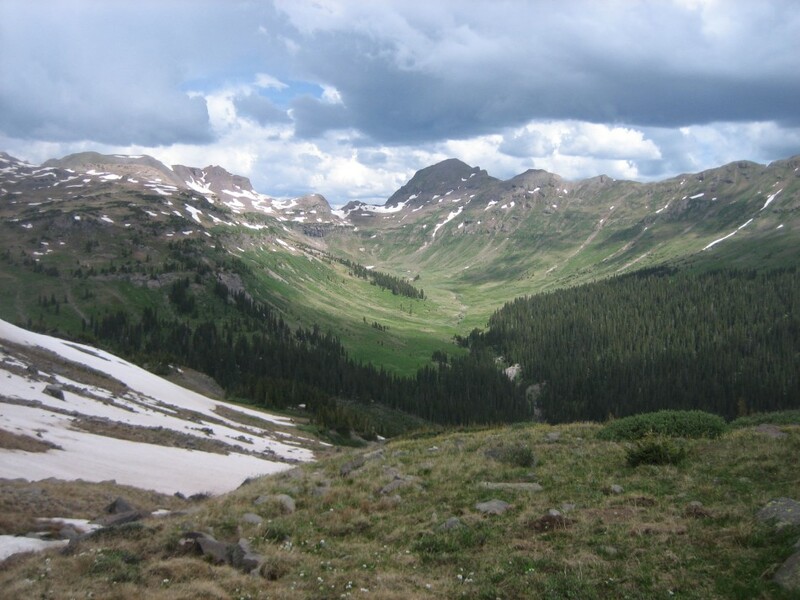 Situated south of Platoro Reservoir, this 17.7 mile hike offers a mix of wooded valleys, alpine meadows and a an exhilerating stretch of the Continental Divide Trail. 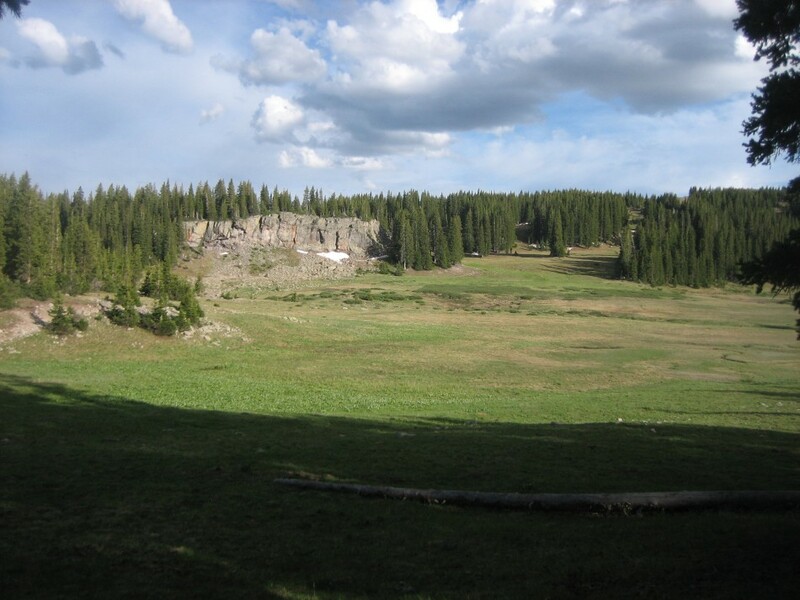 It begins at the Three Forks Trailhead at the south end of FR 247 and follows the Conejos River, El Rito Azul, Continental Divide and Middle Fork Trails. 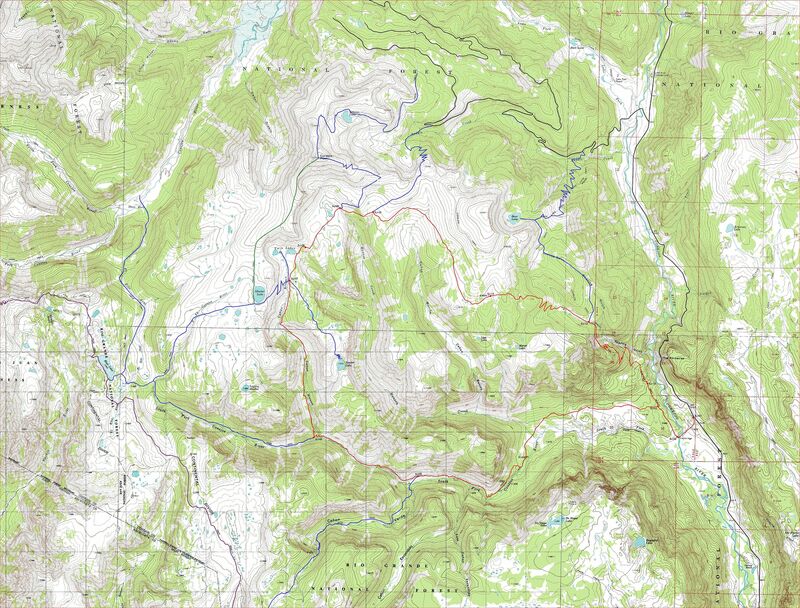 The Maps: The maps are true 1:24,000 scale based on the USGS 7.5 minute quadrangles. 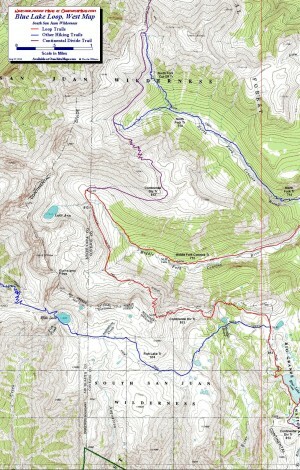 The loop is shown in red and is based on the GPS track taken on the hike. 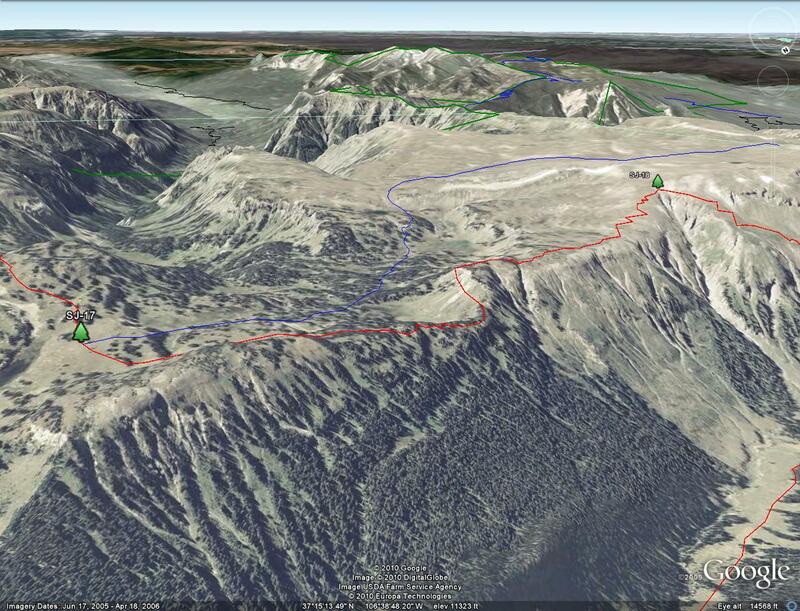 The trails in blue and purple are other trails in the area and are from the Forest Service GIS database. 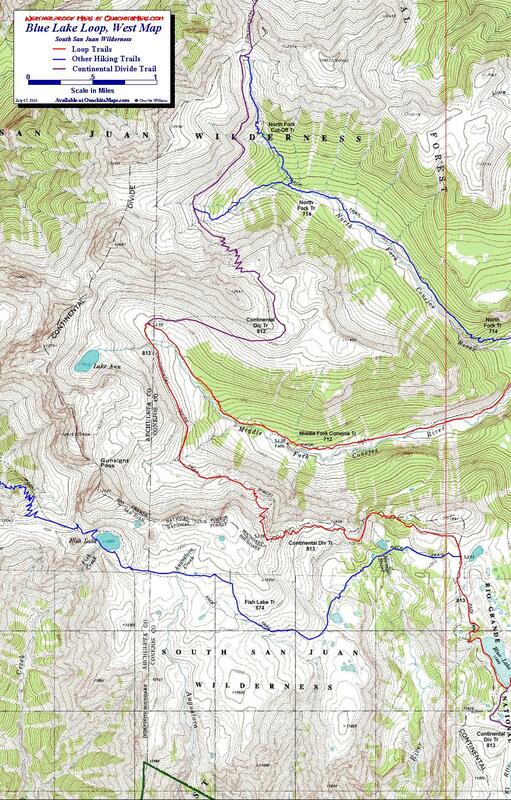 Except for the El Rito Azul Trail, there was very good correlation between the new GPS tracks and the forest service’s version of the loop, so I suspect the other trails depictions are reliable. The difference in the El Rito tracks was so great it looks like the trail may have been rerouted since the FS track was taken (it is obvious that is the case in the higher meadows where the old tread is still evident). 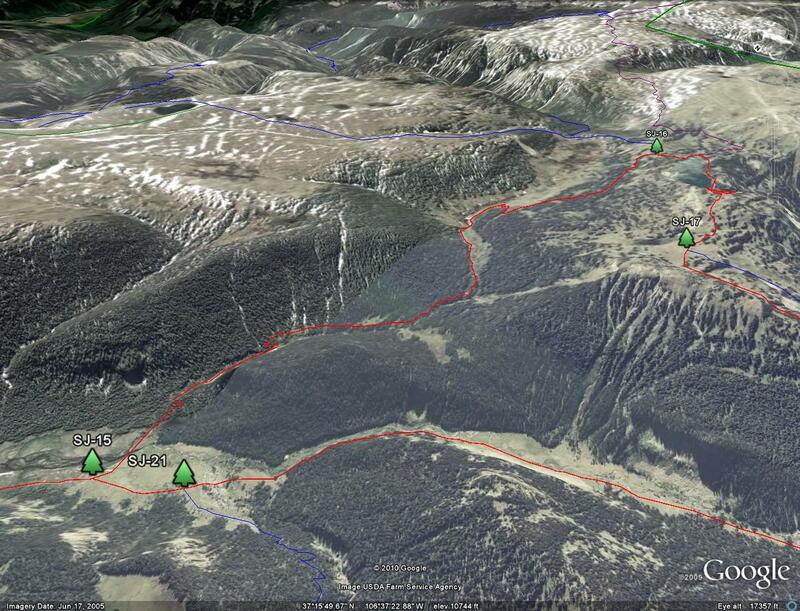 The purple trail is the Continental Divide Trail. 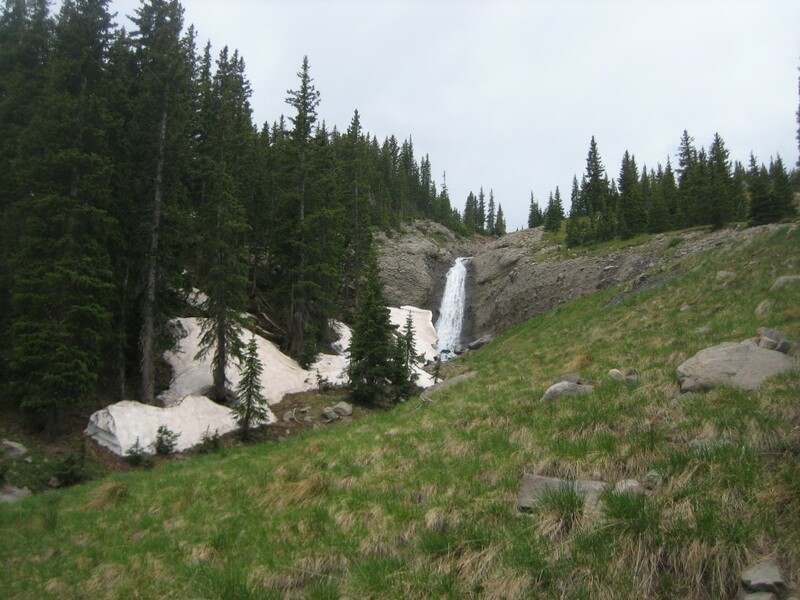 Green depicts unmaintained trials such as to the top of Conejos Peak. 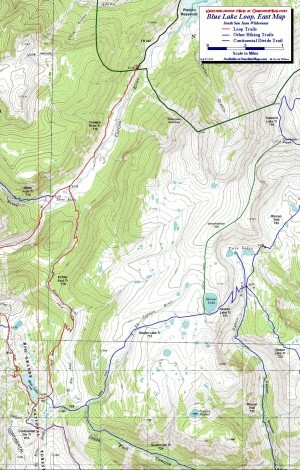 The green and black line is the wilderness boundary. 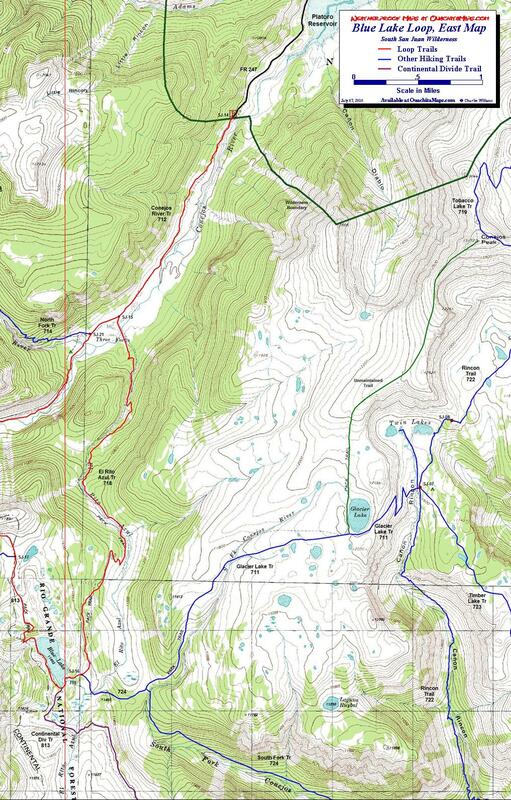 The forest roads are in black and based on aerial and satellite imagery. 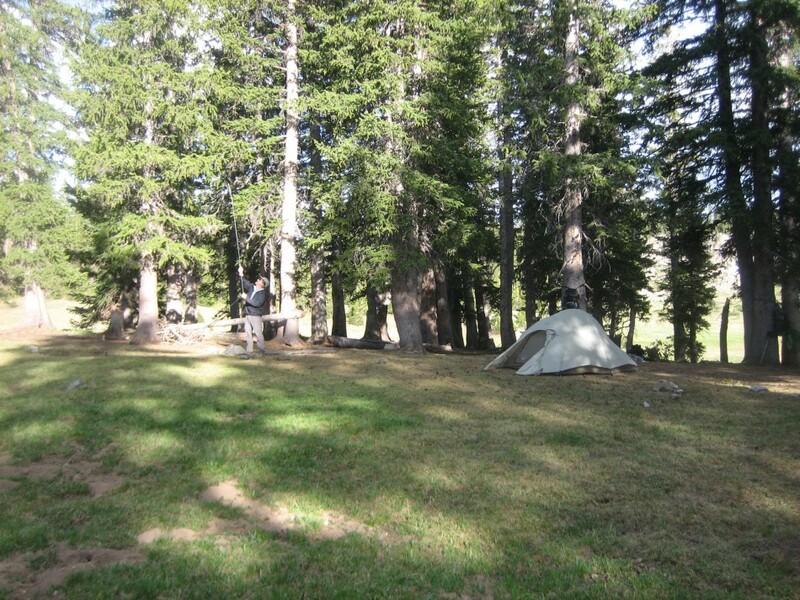 Although camping is at large, selected established camp sites are green “^”. 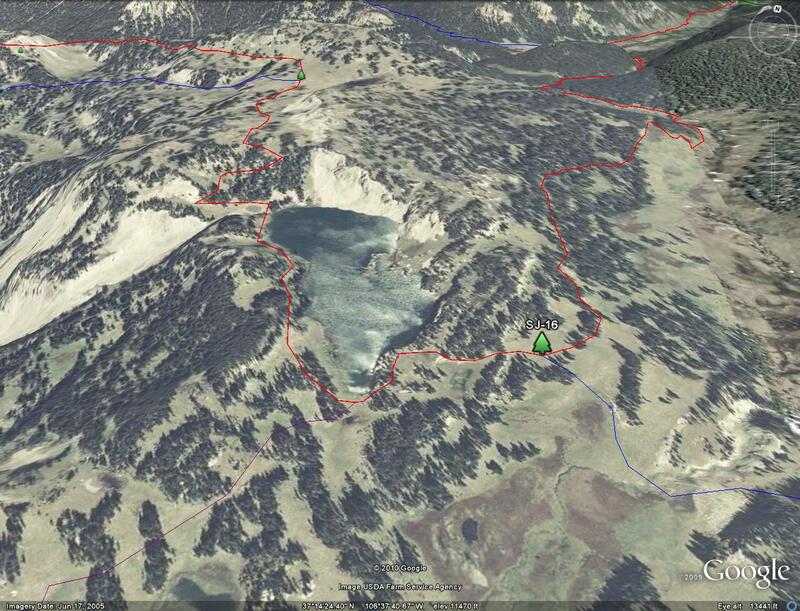 Track of the Loop: This link is to a Google Earth KML track file of the Blue Lake loop. You should be able to right click the file and save it on your computer. 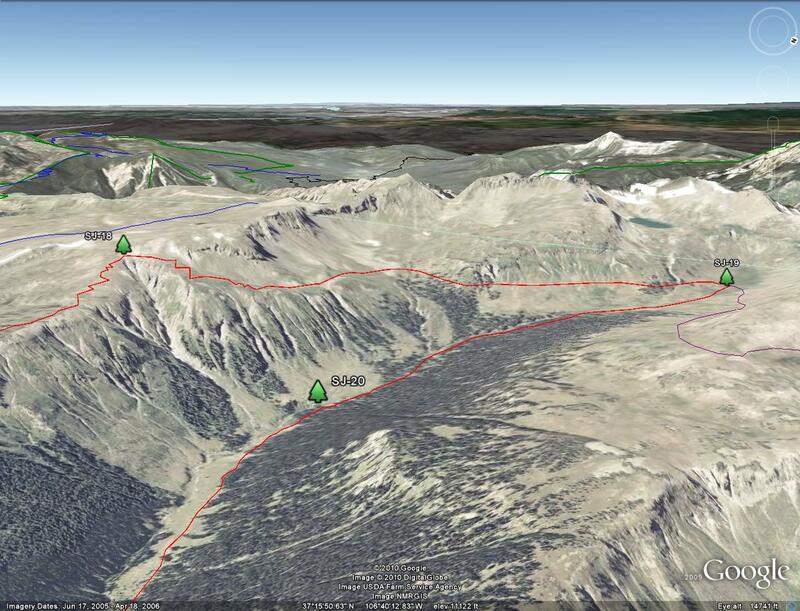 Then open it with Google Earth to see the entire loop in interactive 3-D. You can also load this on top of the wilderness dataset found on the South San Juan page. If you have the right software you can select the tracks you want and load them on your GPS. The Hike. The trip begins at the Three Forks Trailhead at the very south end of FR 247. To get there you need to get to Platoro. While there are several options they all require over an hour on gravel roads. From our base in Alamosa, we used FR 250. FR 250 almost makes a "C" starting west of La Jara (between Alamosa and Antonito), going west to Platoro, south past the South Fork Trailhead (Conejos Peak Loop) and out on Highway 17. The La Jara-Platoro section is a good road but it was curvy, slow and sometimes narrow. The section running south from Platoro to Highway 17 follows the Conejos River and is broad and level the entire way and was our preference. There is also a road from Del Norte that starts of as Pinos Creek Rd but I have never been on it. You get to FR 247 from FR 250, about a mile northwest of Platoro. FR 250 makes a hair pin here and FR 247 shoots off to the west. Follow FR 247 to the end, passing Platoro Reservoir on your left. The trailhead is at the south end of a very large parking area. The only facility is a vault toilet. The trail is at the south end of the parking lot just behind the registration sign (SJ-14, N37.302112 W106.60540 ). 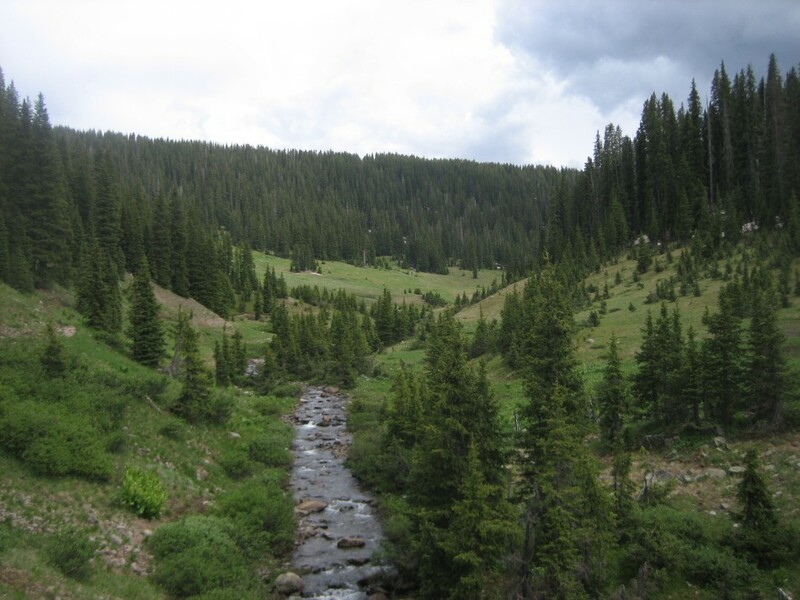 The first 1.8 miles of Trail 712, known as both the Conejos River Trail and the Three Forks Trail, follows the long, broad meadow that surrounds the Conejos River. It gets a bit of wear so in many areas it is a braided trail. At 1.8 miles (SJ-15, N37.27951 W106.62094), the trail splits. We went east following the El Rio Azul Trail, #718. 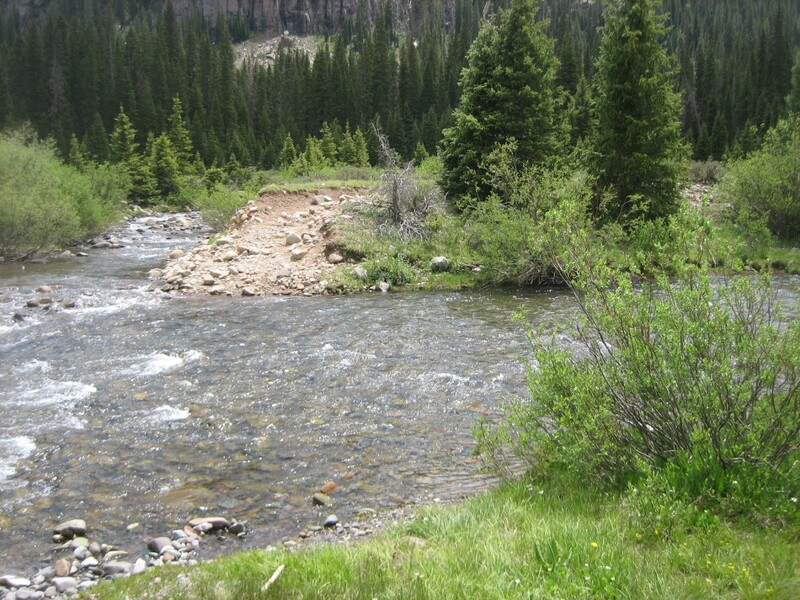 In a 0.1 miles, cross the Conejos River. In late June, 2010, it required taking off our boots to cross. The trail soon enters the forest to begin a 1,200 foot climb to Blue Lake. The forest in the lower valley is Engelmann spruce with some aspen groves. Once you gain some elevation, it is virtually all Engelmann. The trail stays in heavy the forest for about 1.6 miles. After that, it follows the edge of another long meadow. You will sometimes see the old trail in the middle of the meadow. 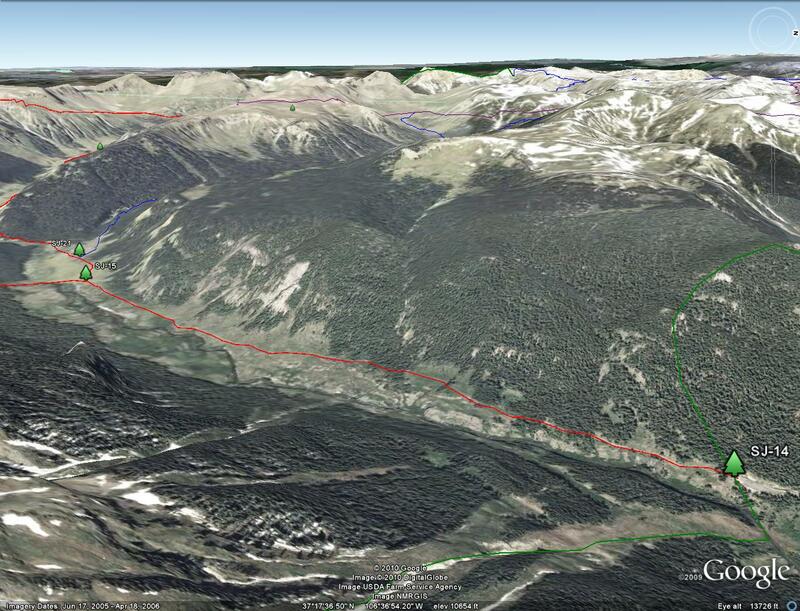 The new trail stays the west edge near the tree line. The trail will enter the forest again at the top of the elevation gain and come back out into meadow as you near SJ-16 (mile 5.5, N37.23926 W106.62530). There is a sign post at SJ-16 announcing Blue Lake in a quarter mile. It is also the junction of the South Fork Trail, #724. 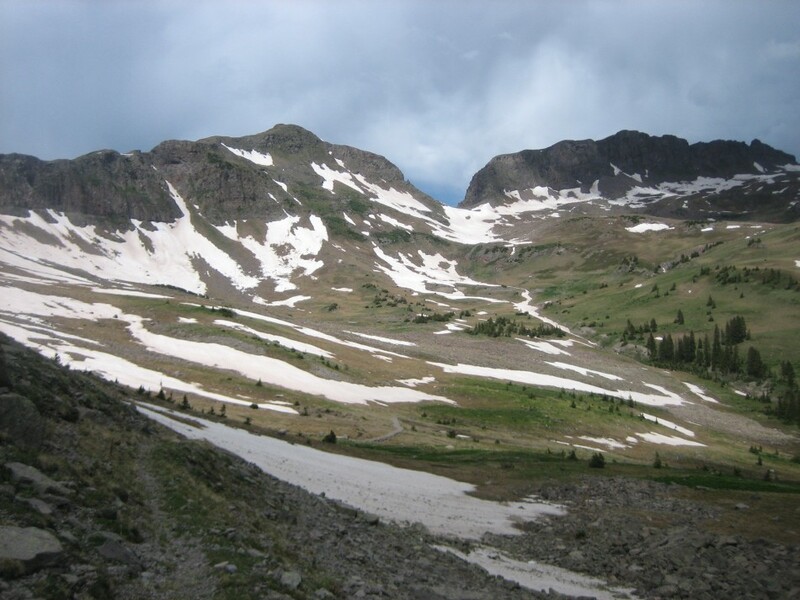 Following 724 will lead to the South Fork Trailhead (used for the Conejos Peak Loop (video)) and offers access to Glacier Lake and Conejos Peak. The little meadow that surrounds the junction is also a campsite. It offers some nice views of the surrounding meadows (video) and easy access to Blue Lake (video). Since there is a 200 foot camping restriction at Blue Lake and because most of the sites were trashy, we stayed there. Blue Lake is pretty with its clear water and back drop of small bluffs of volcanic rock. There are a lot of social trails on the southwest side. Your best bet is the follow the trail west from the SJ-16 signpost (heads up hill) to the lake. 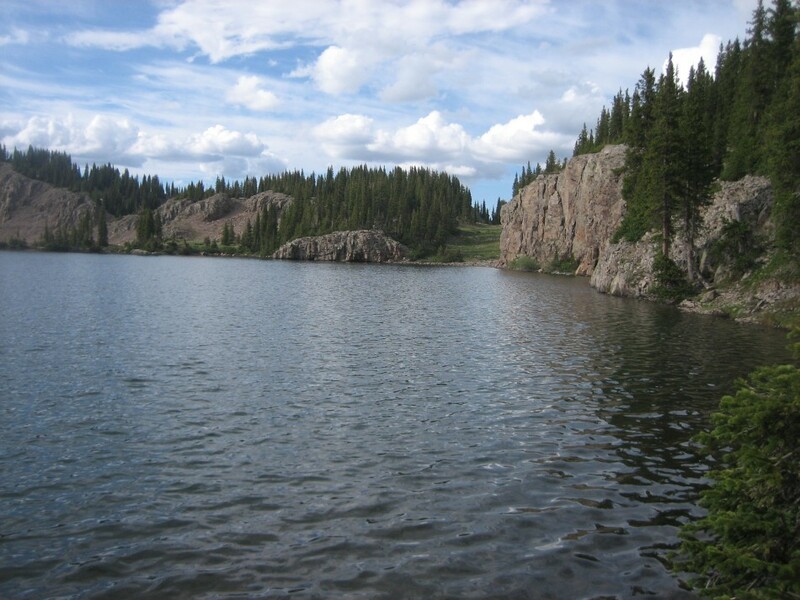 Cut through the old campsite (marked as no camping allowed), wrap around the south tip of the lake, follow the obvious trail slanting up the hill, pass the campsite and fire ring and head north. 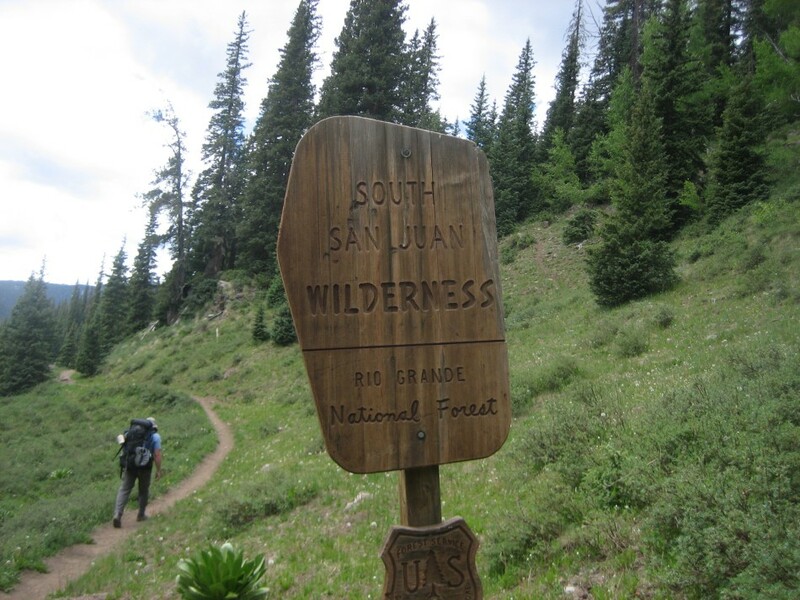 Within a 100 feet or so you will pass a trail marker for #718 and then a sign for the Continental Divide Trail, #813. 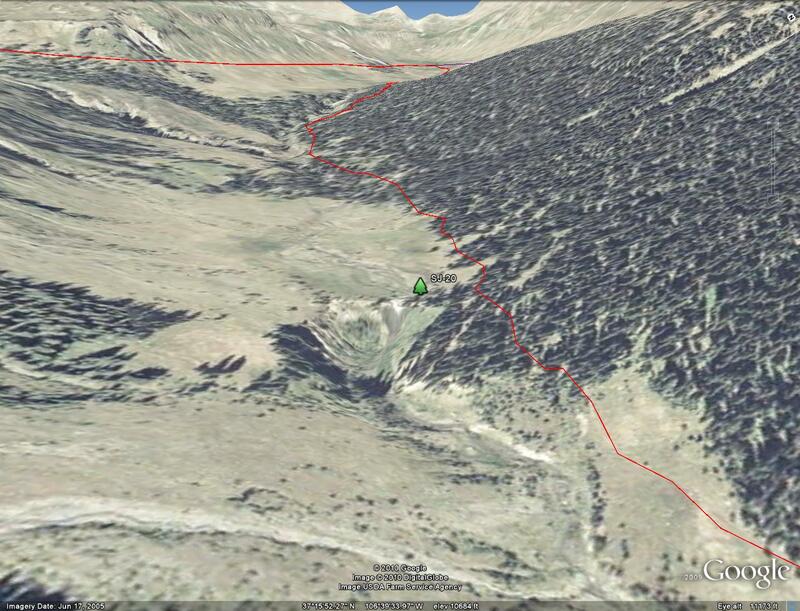 You will stay on the CDT for the next 5.9 mile until SJ-19. 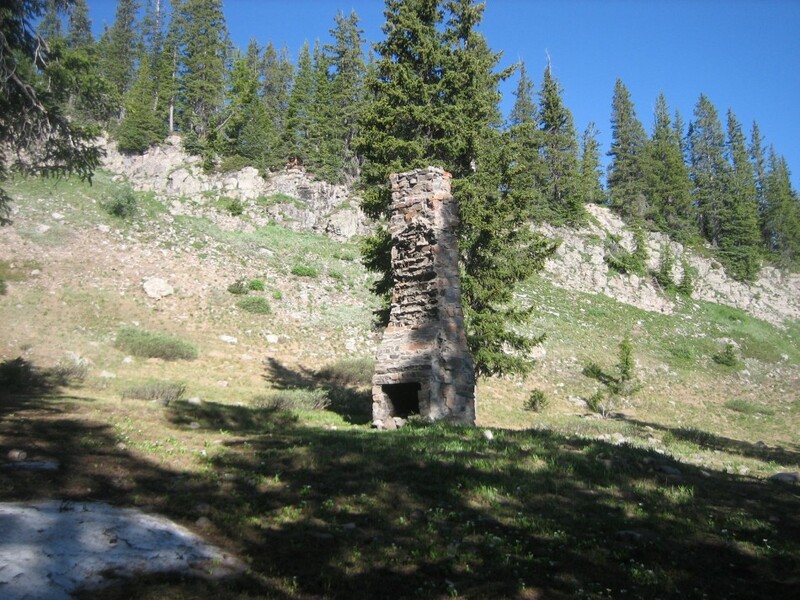 Just past the CDT sign is an old chimney. 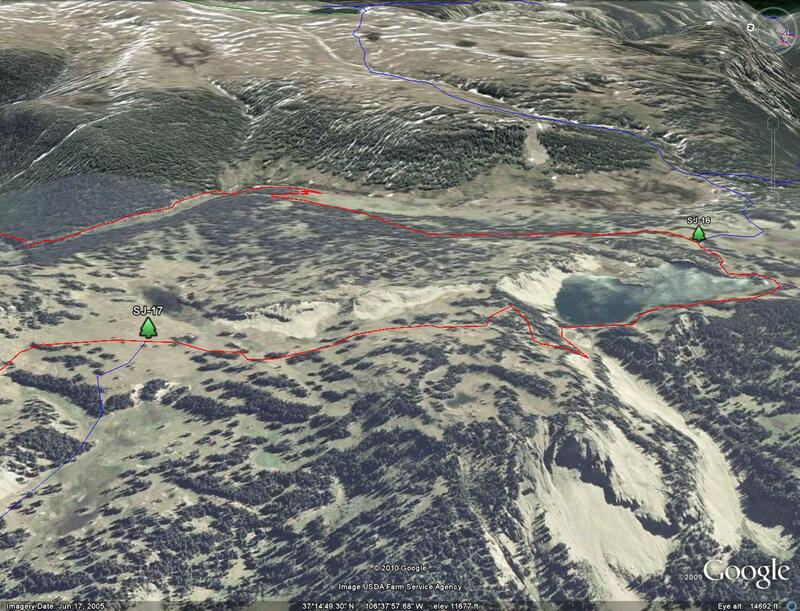 The trail follows the lake and just before you reach the northwest corner, it splits. Take the trail to the right, cross the small outlet creek near the lakes edge and start the 200 foot climb out of the lake basin. The other one circles to the left and dies out at the outlet stream. The section of the CDT between Blue Lake and Fish Lake Trail junction (video) (SJ-17, N37.25239 W106.63492) is one of my favorites. 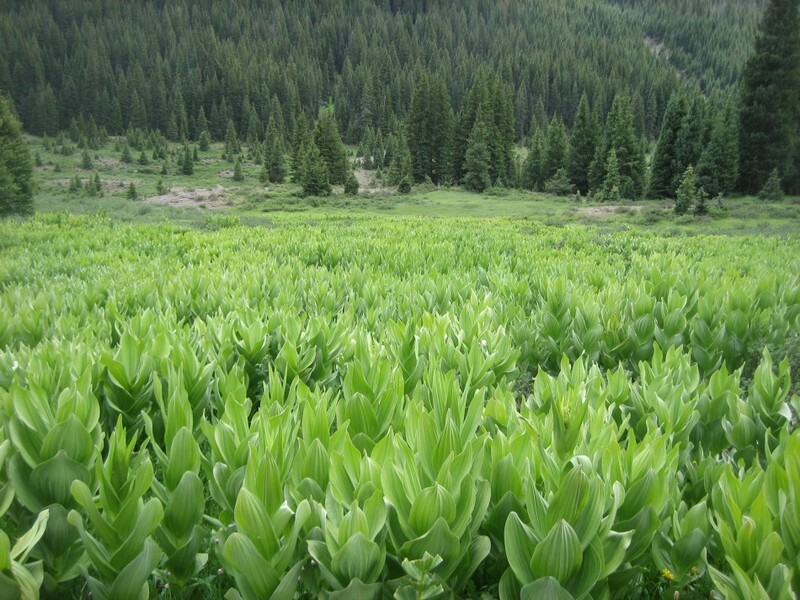 The combination of high mountain meadows accented by the spruce forest gives a very soft and serene feel. There was water available while we were there so next time, that's where I'd camp. After the junctions you will be on the south side of the Continental Divide, with some great view of the upper stretches of the Navajo River Valley. 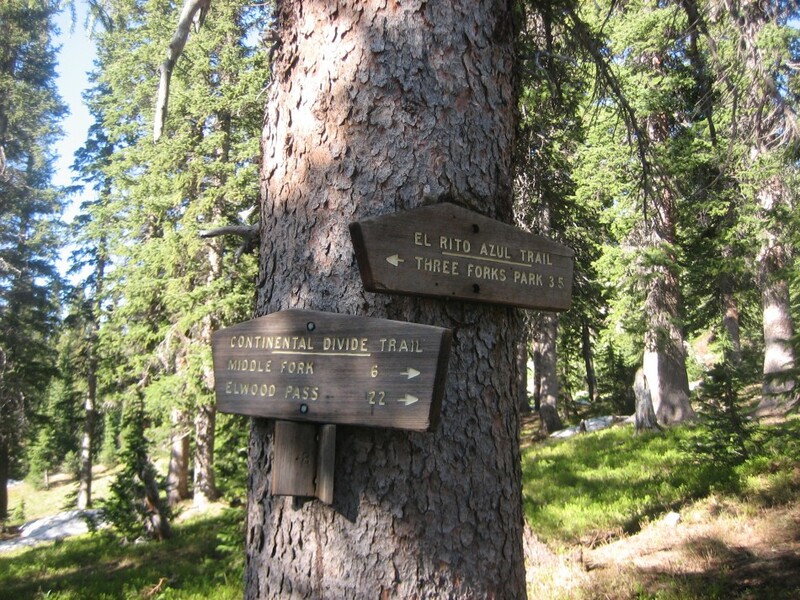 At about mile 7.7, the trail leaves the meadow and enters the forest. 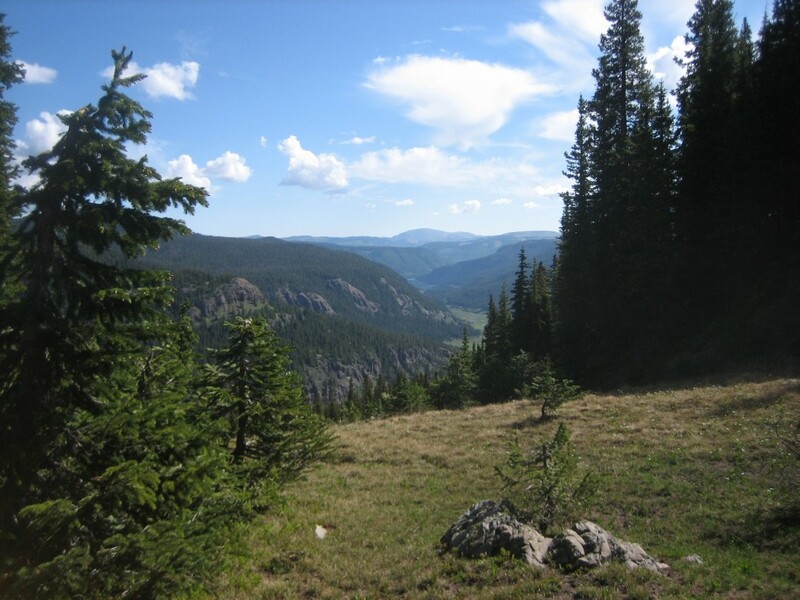 As the trail zigzags across the CD for about a quarter mile it passes a clearing with a vista to the north of the Conejos Valley, all the way to Platoro Reservoir. After coming up to the back side of a bald saddle (which if you go to the top will get more view of the Conejos Valley), you see the trail climbing a bluff towards the south. This is the beginning of 550 foot climb to the high point of this hike, culminating at about 12,150 feet (SJ-18, N37.25389 W106.66211). At this point you are well above the tree line ready to start your descending traverse across the face of the north ridge. You will lose that 550 feet in 0.9 miles. 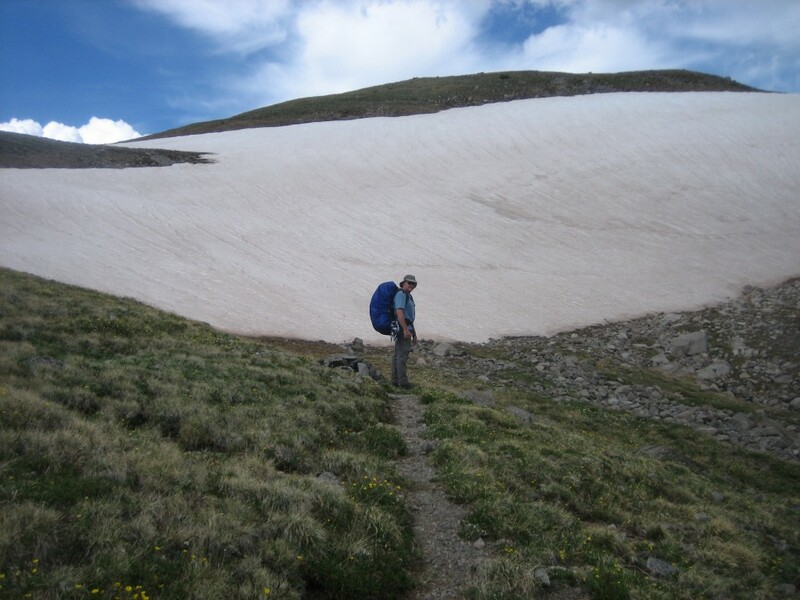 In late June there were still some good sizes snow fields. Most had conveniently recessed from the trail but there were several smaller ones that required kick stepping. When you get to the cirque below Gunsight Pass you will see the trail turn into a super highway, the result of trying to build some support over what was otherwise very soft ground. After crossing the creek that drains the cirque, the trail levels off at a little under 11,000 and tracks towards the head of the Middle Fork Valley. Don't miss the small waterfall in the creek from Lake Ann. Once you get to the head of the valley the trail gets lost in all the grass. There is a sign on one of the few trees announcing the CDT arrows to Elwood Pass and Blue Lake and a post marked 712 a little further down hill (SJ-19, N37.27784 W106.67919). Trail #712 is the Middle Fork Trail, the one we took for this loop. There is not much of a tread this high in the valley so your best bet is to just head down hill staying left (north of the stream. This is especially true early in the season when it might be a little boggy. Once you get to the trees, the trail can be found between the tree line and the creek. The trail is mostly in the forest for the next mile and was in really bad shape. While easy to follow, it was braided and torn up by horse and cattle and there must have been a big blow because there were seemingly hundreds of downed trees. SJ-20 (N37.26470 W106.65947) is Conejos Falls. 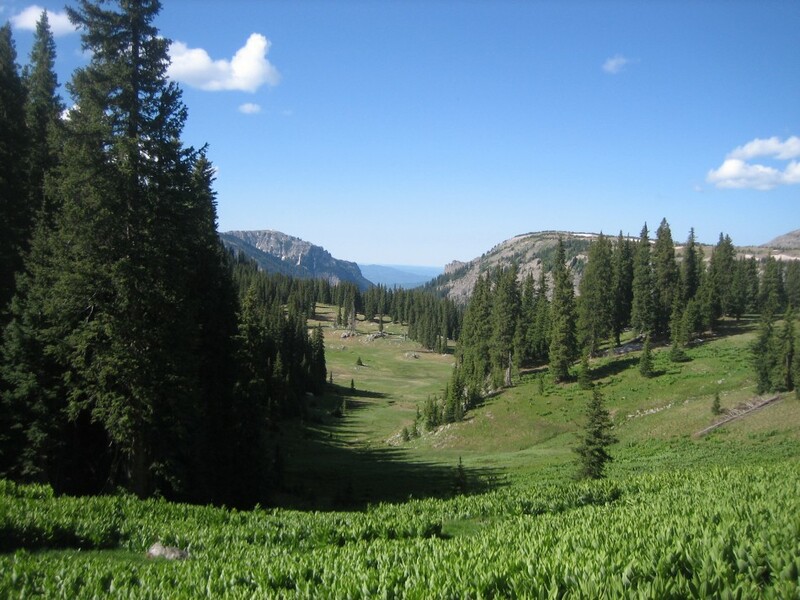 It is easy to spot because you will be hiking next to a meadow, enter the trees and find a trailside campsite on your right. 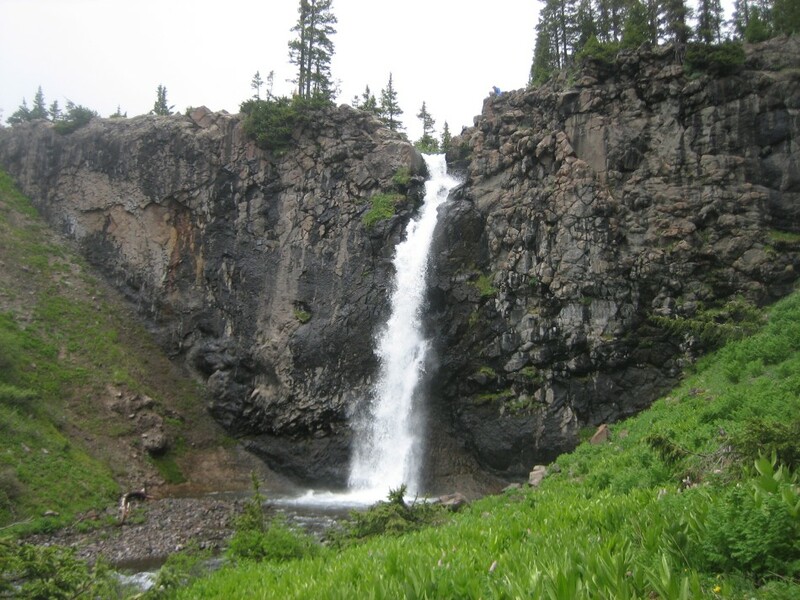 Look for the short trail behind the camp to see the falls from the top. To get a view from the bottom you need to either take the main trail further down and cut back, or look for the informal trail where you can scramble down. After another 0.1 mile of downed trees and hoof damage, the trail enters a long meadow. From here the hike is mostly in meadow until the trailhead. 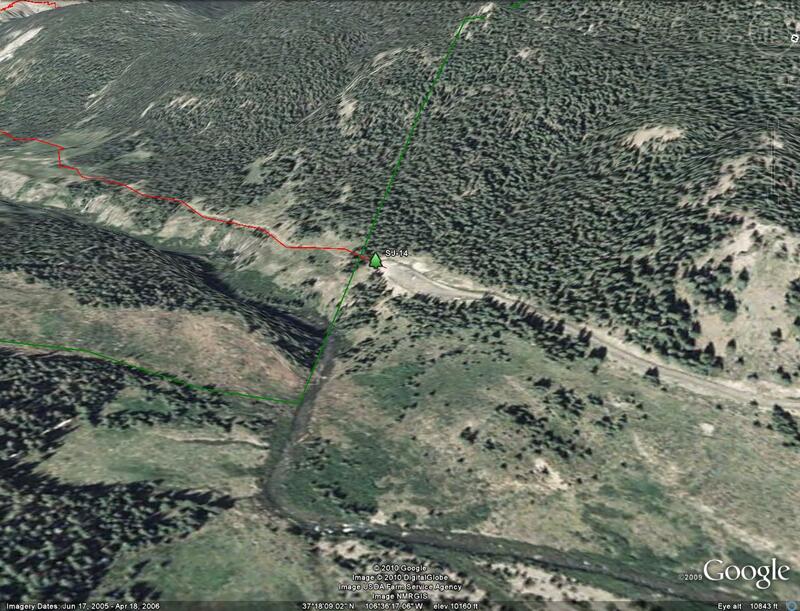 About a 0.1 of a mile before the North Fork crossing, there is a beautiful campsite back the left (west). Flat and grassy surrounded by a lush forest. The crossing was boulder hopping. The creek is braided but it still took a little searching for a place to cross dry. Another 0.1 mile takes you past the North Fork Trail, #714, and mile 15.6 (SJ-21, N37.27751 W106.62495). Another 0.3 miles takes you to Three Forks junction (SJ-15) where you close the loop. An easy 1.8 miles takes you back to the trailhead and mile 17.7. If you look at the Excel spreadsheet of the trip mileage, you'll see there is a work sheet for a slightly longer trip. Stay on the CDT at SJ-19 and go over the nose that separates Middle and North Fork. Come down the North Fork Trail for a 20.2 mile hike or extend it even further by coming down the North Fork Cut-off trail. 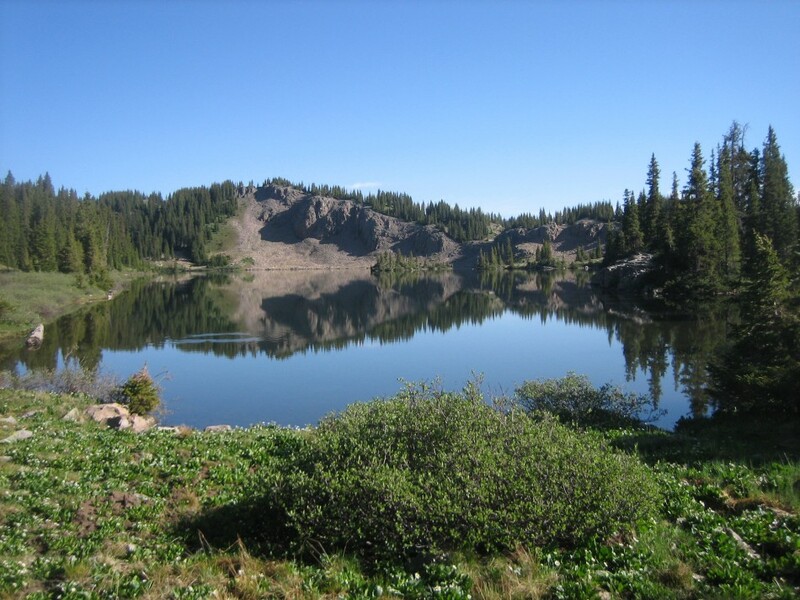 Make it even longer by going up to the Adams Fork Trail (713) and come out on FR 247 a mile and a half north of the trailhead parking lot. .
Info: USGS 7.5 minute Quadrangles: Platoro, Victoria Lake, Elephant Head Rock and Summit Peak. 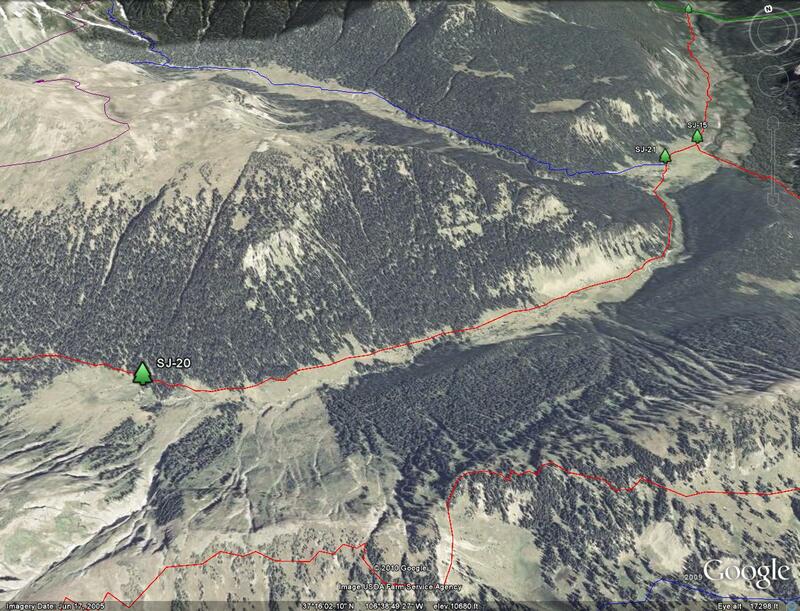 Rio Grande National Forest, 1803 W. Highway 160, Monte Vista, CO 81144, Telephone: 719-852-5941. Website: http://www.fs.fed.us/r2/riogrande/. Direction: From Antonito CO take Highway 17 west for 22.5 miles. Turn right on Forest Road 250, a gravel road marked with a sign for Platoro. Go north 24.3 miles to FR 247 (you will have just past Platoro). Go straight on FR 247 and drive 6.3 miles until it ends at the Three Forks Trailhead (the Platoro Reservoir will be on your left most of this section). To Buy Maps: These maps are FREE. Click on image to access full size maps and download them. Both maps are also available as a two map set on color, weatherproof, Rite-in-the-Rain paper (11x17). The maps are $5/sheet ($10 for the set) plus S&H by emailing cew5151@gmail.com.